West Side Park was the name used for two different baseball parks that formerly stood in Chicago, Illinois. They were both home fields of the team now known as the Chicago Cubs of the National League. Both parks hosted baseball championships. The latter of the two parks, where the franchise played for nearly a quarter century, was the home of the first two world champion Cubs teams (1907 and 1908), the team that posted the best winning percentage in Major League Baseball history and won the most games in National League history (1906), the only cross-town World Series in Chicago (1906), and the immortalized Tinker to Evers to Chance double-play combo. Both ballparks were what are now called "wooden" ballparks. The initial stadium was the club's home beginning in 1885, succeeding Lakefront Park. Although the park's useful life turned out to be as short as the ball club's stay at the Lakefront (seven years), it was also memorable, as the team won back-to-back National League pennants in its first two seasons there. The park was located on a small block bounded by Congress, Loomis, Harrison and Throop Streets, with the diamond toward its western end. The elongated shape of the block lent a bathtub-like shape to the park, with foul lines reportedly as short as 216 feet. The stadium held roughly 10,000 fans. In addition to the diamond, the park held a bicycle track which encircled the playing field, at the height of the contemporary bicycle craze. The Cubs (then known as the White Stockings) had had to secure a new property after 1884, and it took longer than anticipated. The season began on April 30, a month later than it does today, for a 112-game schedule, 50 fewer games than today's major-league schedule. The club spent the first five-plus weeks of the 1885 season on the road and the park was finally opened on June 6 with a victory over the St. Louis Maroons, late of the Union Association. Despite being "wanderers" early in the season, the powerful Chicago club, under player-manager Cap Anson, came home with an 18-6 record. They would sweep a four-game set in their first homestand and romp through the league schedule, finishing at 87-25. The only team that gave them any problem was the New York Giants, who won 10 of the clubs' 16 meetings and finished just two games behind Chicago in the standings. If projected to a modern 162-game schedule, that translates to 125 and 123 wins, respectively, in a very lopsided league (the third-place club finished 30 games back). Chicago captured the National League pennant that season and also went on to win the league crown in 1886. 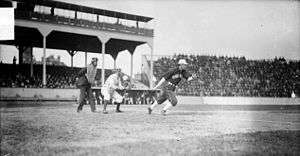 The site saw postseason action those two years, as the White Stockings squared off in 19th-century World Series play against the St. Louis Cardinals, then playing in the rival American Association and known as the St. Louis Browns. The championships of the 1880s were disorganized in comparison to the modern World Series, exemplified by the 1885 contest, which ended in dispute with no clear winner. The 1886 World Series was more conventional, and was won by the Browns. Those matchups were the first on-field confrontations of the Cubs and Cardinals clubs, which remains one of baseball's strongest rivalries today. The site also saw "bonus baseball" in 1887, as a neutral site for Game 14 of that year's unique 15-game "traveling" World Series between the Browns and the Detroit Wolverines. In 1891 the team split its schedule between West Side Park and South Side Park. The first West Side Park was abandoned after the 1891 season, with the team playing at home exclusively on the South Side in 1892. The site of the first West Side Park is now occupied by the Andrew Jackson Language Academy, whose address is 1340 West Harrison. Center field – 560 ft. In May 1893, the club opened the second West Side Park a few blocks west-southwest of the first one, on a larger block bounded by Taylor, Wood, Polk and Lincoln (now Wolcott) Streets. It was located at 41°52′13″N 87°40′21″W﻿ / ﻿41.87028°N 87.67250°W﻿ / 41.87028; -87.67250. They split their 1893 schedule with South Side Park, then moved into the new ballpark full-time the following year. Some sources state that the club moved to this location to gain attendance from the World's Columbian Exposition, as South Side Park was within walking distance of the 35th Street station on the new South Side Rapid Transit line, which reached the exposition grounds at Jackson Park. The second West Side Park is now also sometimes called West Side Grounds, but during its life, it was most often called Park. Home plate was in the northwest corner of the field, at the Polk and Lincoln intersection. The right field fence paralleled Taylor, with flat apartments between the high fence and the street. There were also flats across Wood Street to the east, behind left field, giving the park (for a few years, at least) a degree of the ambiance that Wrigley Field would later be famous for. Cook County Hospital was across the street to the north, behind third base. Like the first West Side ballpark, the new facility was hemmed in by the streets around it, creating a rectangular playing area. The foul lines were originally reported as 340 feet, while the deepest part of center field was initially reported as 560 feet. Although that sounds symmetrical, the left field side was much more spacious, and the distance to center was really the diagonal of the rectangle. The remainder of the block, to the south (right field), was occupied by flat apartments just outside the fence that ran along right to center field. The original grandstand was reportedly double-decked, and the park held about 16,000 patrons. As with other parks of the era, fans were often permitted to stand along the outer perimeter of the playing field itself, so the park frequently drew well in excess of its official capacity. On August 5, 1894, during its first full season as home to the Cubs (by then known as the Colts), West Side Park suffered severe damage from fire during a game against the Cincinnati Reds. As the fire spread through the first-base side stands, panicked fans trying to escape pressed up against the barbed wire fence separating them from the playing field. Only quick action by several players in wrenching the fence open averted a major tragedy. The burnt stands were simply roped off, and the season resumed the next day, with the burnt area fenced off, and the spectators sitting on the left side of the diamond. Despite that near-disaster, the club rebuilt the park out of wood. One highlight, albeit for the visitors, occurred on July 13, 1896, when Philadelphia Phillies outfielder/firstbaseman Ed Delahanty smacked four home runs in one game, only the second player to do so. In contrast to Bobby Lowe's feat two years earlier, which was aided by a short foul line, all four of Delahanty's were inside-the-park. After Delahanty's third, center fielder Bill Lange drew a laugh by calling "time", stationing himself in deep-deep center, near the clubhouse, seemingly a mile away, and then waving the pitcher to continue. Delahanty then got the laugh on Lange by knocking it between the clubhouse and the fence, again circling the bases while Lange scurried for the ball. However, Chicago got the last laugh, winning the game, 9-8. As the park entered the new century, it featured a small covered grandstand behind home plate. Behind the home plate stands, the team and ticket offices were housed in a fairly ornate two-story brick building topped with statues of baseball players. Uncovered bleachers extended along both foul lines and into left field. Beyond left-center field, the bleachers gave way to a small clubhouse. The right-field bleachers were only five to ten rows deep, sitting underneath a free-standing billboard that ran above the length of the bleachers. The billboard frequently featured large ads for the sports pages and the sportswriters of local newspapers such as the Chicago Tribune and the Chicago Daily News. A scoreboard was located on the extreme right end of the billboard, toward the right field corner. Much like today at Wrigley Field, several of the rooftops beyond the outfield bleachers offered bleacher seating of their own, at least for a few years. The second West Side Park was the home of the Cubs' most successful teams of the 20th century. From 1906 through 1910, the Cubs won four National League pennants and two World Series championships. The 1906 World Series between the Cubs and the Chicago White Sox featured the first cross-town matchup in Series history. Although the Cubs had one of the most successful seasons in major league history, winning 116 contests against just 36 losses, they were defeated by the light-hitting White Sox four games to two. The Cubs finally brought a championship to West Side Park the following year when they swept the Detroit Tigers after ending the first contest in a tie. In 1908, West Side Park became the home of the first repeat world champions when the Cubs again bested the Tigers. After a one-year absence, the Cubs returned to the Series in 1910, only to lose in five games to the Philadelphia Athletics. The 1908 championship turned out to be the franchise's last World Series championship until 2016, ending a staggering 108 year drought for the franchise. Right field area and rooftop bleachers in 1908. The ballpark expanded with the club's rising fortunes. For 1905, several rows of private box seats were built on top of the original grandstand roof behind home plate. That same year saw the construction of a new two-story brick clubhouse structure, fronted by columns, out in far left-center. After just two seasons, jury-box bleachers were built directly in front of and over the clubhouse. 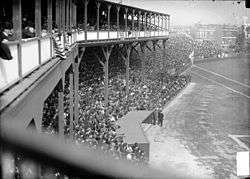 During the 1908 season, the bleachers along the first and third-base lines were gradually covered and topped by more private box seating. By the early 1910s the wooden ballpark was showing its age, in large part due to neglect by Charles Murphy, the unpopular owner of the Cubs (one of whose alternate, media-driven nicknames was the unflattering "Murphy's Spuds"). 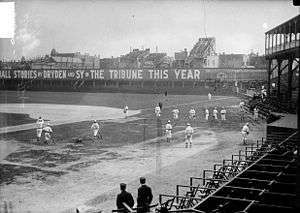 In 1910, the neighborhood view beyond the right field outfield wall was blocked off by an enormous, unsightly billboard. By 1912, the left field view was similarly obstructed by a large billboard which also served as the new scoreboard. The enclosure of the park was completed with the installment of billboards in dead center. At this time, the jury box bleachers in left-center field were removed, adding to the new claustrophobic feel of the outfield. With gambling becoming an increasing problem in baseball, starting in 1911 the playing field was adorned with large signs (as with some other major league ballparks) reminding fans "No Betting Allowed." Additionally, the dilapidated park found itself competing unsuccessfully with new steel-and-concrete baseball venues. The Chicago White Sox inaugurated Comiskey Park in 1910. Four years later, the upstart Federal League placed a franchise on the North Side and began play in Weeghman Park. By 1915, the Cubs were the third most popular team in a three-team city. When the Federal League collapsed after the 1915 season, Charles Weeghman, owner of the now-defunct Chicago Whales, was allowed to buy a substantial interest in the Cubs. One of his first acts was to abandon West Side Park and move the Cubs to Weeghman Park for the 1916 season. Weeghman Park survives today as Wrigley Field. West Side Park hosting Buffalo Bill's Wild West in 1916, the year after the Cubs moved across town to Weeghman Park. One of the few items the Cubs took with them, besides normal operational properties, was a set of large letters comprising a sign that had run across the back of the grandstand and was to be read from the outside of the park: "CHICAGO NATIONAL LEAGUE BALL PARK". This sign was placed along the top of the Weeghman Park wall bordering Sheffield Avenue, visible to everyone in the park, and of course reading backwards to the spectators. This oddity lasted a few years at Weeghman / Cubs Park until it was brought down during an early remodeling. West Side Park continued to host semipro and amateur baseball events for a few years. It even served as a setting for Buffalo Bill's Wild West, thus converting the entire former ballfield into a different kind of "bull pen". The ballpark was torn down in 1920. Murphy sold the leftover lumber for scrap. The site is now occupied by the University of Illinois Medical Center. This West Side Park was the only park that witnessed the Cubs as World Series Champions from 1908 to 2016. The Cubs won back-to-back titles here in 1907 and 1908. Left Field – 340 ft. Right Field – 340 ft.
↑ Snyder, John (2010). 365 Oddball Days in Chicago Cubs History. United States: Accessible Publishing Systems. p. 570. ISBN 9781459607255. .